Wurst mitten no. 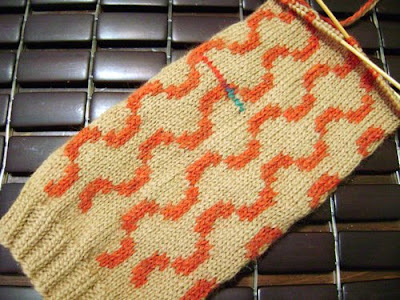 1 plods on: As you can see, I'm well past the thumb (that's that red/green stripe on the left-hand side of the mitt) and I'm closing in fast on those finger decreases. So why does it feel like this mitten is taking forever? I know that colourwork actually seems faster than plain knitting, and it's true -- it seems that every time I stop and glance down at my work there's a whole new row of happy little sausages smiling back up at me. It just feels slow for some reason. As far as I can recall, I have experienced this effect once before -- with Swedish Fish, of all things. Now, I suspect that that's because both mittens feature a simple, very short (row-wise) motif that's easily memorized and quickly worked. As such, I suppose that the problem is with me expecting the mitten to grow at a crazy-fast rate (as opposed to the normal rate, at which it is currently growing.) Combine the two together and there you have it -- one slow seeming mitten. At least, that's how I see it. I have ideas for other mittens! Let's see if something comes of them! January 16, 2009 at 8:55 p.m.
You definitely inspired me to knit my own pair of Give a Hoot. I finished the first one tonight and they are lovely! January 17, 2009 at 1:28 a.m.